Welcome to Vista Santa Rosa Real Estate where you can access all Vista Santa Rosa homes listed on the local MLS. Below is a sample of available properties and you can find many more by following the City of Vista Santa Rosa real estate link at the top of the page. If you have any questions or would like to set up a private showing, please contact us online or give us a call at 760-285-3578. Vista Santa Rosa, California (unincorporated), is a rural equestrian ranch community, on the southeastern end of the Coachella Valley. Approx. 20 miles in area, Vista Santa Rosa, is comprised of large, Equestrian Estates & Farms, Date Farms and many Agricultural Farms. 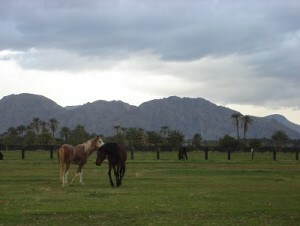 Vista Santa Rosa lies in close proximity to the HITS Desert Horse Park, a world class equestrian facility, which is one of the largest hunter/jumper horse show venues in the country. Vista Santa Rosa is within the La Quinta sphere of influence, which means La Quinta could potentially spread it’s boundaries into VSR. VSR is also close to several Casinos for those who like that type of adventure, and PGA West or Indian Palm Country Club for Golfers. The Empire and Eldorado Polo Clubs are also nearby, making Vista Santa Rosa an ideal place to live for horse lovers and those seeking a relaxed country lifestyle amid wide open spaces, pastoral meadows and stunning mountain views. Deer Creek, a renowned Polo Pony Training Facility, is located in Vista Santa Rosa. VSR also offers some of the best land Values in price/acre as well as some of our most beautiful Equestrian Estates for sale. Vista Santa Rosa is also conveniently located close to the Jacqueline Cochran Regional Airport located in Thermal. This airport is a choice destination for business and private aviation within Riverside County, and the entire Southern California region. The Thermal Airport is currently undergoing a 1.2 million dollar upgrade. With perfect year round weather and the many amenities, attractions and outdoor recreation offered in the nearby valley cities, Vista Santa Rosa is ideal for Equestrian enthusiasts, private pilots or people craving a larger piece of their Desert Sun Lifestyle.